Top 5 Best Castor Oil of 2019: Do NOT Buy Before Reading This! How much do you know about castor oil? Also, if you’re looking for the best castor oil for skin, hair, eyebrow regrowth or fuller lashes, how will you know which is best? When I first started to do research about castor oil, there seemed to be very little clinical evidence. However, I could find plenty of anecdotal evidence. People were raving about the benefits and the fantastic results they’d had using castor oil. There were plenty of before and after photos to support the claims. I realized that different people need different types of evidence to help them decide what to buy. Some shoppers want all the proven, researched facts and will pay a premium for natural and environmentally friendly products. Others might not even know that there’s a debate over certain ingredients. They just want a product that works! Here’s a great article to help you decide what type of shopper you are. Does Castor Oil Promote Hair Growth and Prevent Hair Loss? So, this article is mix of research and opinions based on what many people are saying about castor oil. I’ll talk a bit about products I have been reviewing and try to give you some guidelines about how to understand the labels so that you can choose the product that is best for you. 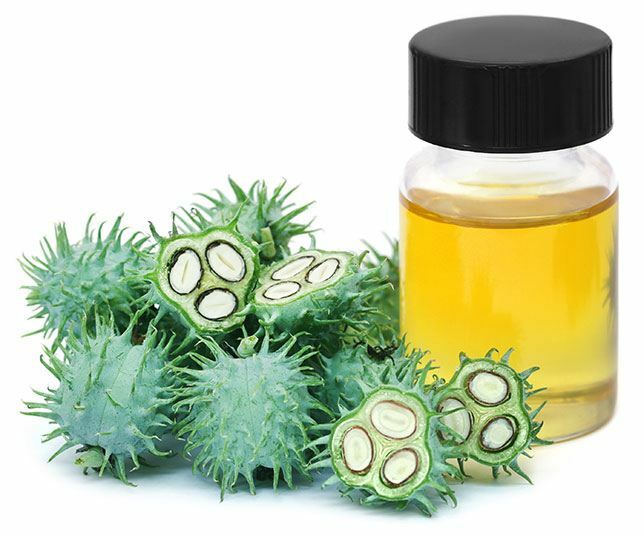 Castor oil is produced by pressing the seeds of the castor oil plant (Ricinus communis L.). Castor oil is a unique vegetable oil because about 90% of its fatty acid content is ricinoleic acid. It is different from all other seed oils, because it is both unsaturated and hydroxylated (I suppose that means something to a chemist!). Castor oil has the unique ability to mix with water and dissolve in alcohol, which is very unusual for an oil. This has something to do with something to do with its polarity. It also has the ability to convert other chemical compounds into new derivatives. It is widely used for waxes, greases, paints, coatings, lubricants, brake fluids, polymers, fuel and biodiesel. Most of us have heard about its laxative properties, but it is more widely used in medicine as a drug delivery vehicle. It is also an important ingredient in the cosmetic industry for soaps, cleansers, moisturizers, lipsticks and a host of other products. Castor oil is said to have anti-inflammatory, antimicrobial and antioxidant properties. This helps with scalp health, and a healthy scalp is one of the first steps to healthy hair. The polarity of the oil helps it provide a good "seal" around the hair shaft, preventing loss of moisture. However, this is not an impermeable seal, like you get with a mineral oil. Some of the oil is absorbed into the hair shaft, giving it additional strength. Castor oil is also particularly beneficial during very dry weather. The polarity (ie, the ability to mix with water) also has the benefit of making the the oil is easy to rinse off your hair, without the need for shampooing. This is particularly helpful for Afro and textured hair. It means that you can re-wet your hair and re-apply the oil often. There is no buildup on the scalp or hair shaft which can lead to scalp irritation and heaviness in the hair. A useful tip is to mix castor oil and coconut oil as a mask on your hair for the night before you shampoo. It prevents "hygral fatigue" (repeated swelling and drying of hair), and the coconut oil reduces protein loss in hair. Just about every blog you read on castor oil says that it promotes hair growth. This includes growth of eyebrows and eyelashes. There are many videos and photographs supporting these claims. Unfortunately, there are not many clinical studies to support this. Massaging your scalp with oil stimulates blood flow, and this has been shown to prevent hair loss and early balding. Stimulating hair growth takes time and regular treatment. A study from Japan showed that it took 24 weeks before scalp massages began to show any effect. Growing more hair took anywhere from 2 to 10 years, but when the follicles have shrunk, this growing phase can be just a few months. Scientists link this shrinking of the follicle with high levels of a molecule called prostaglandin D2 (PGD2). Researchers is China found that ricinoleic acid was effective for inhibiting PGD2, and should be further investigated as a possible solution for hair loss. They also found that ricinoleic acid had excellent skin permeability and very little propensity for causing skin reactions. Castor oil is very high in ricinoleic acid, so we expect it to deliver the same results. It is unlikely to reverse hair loss, but it may help prevent further hair loss. Another reason for hair loss is oxidative stress, which can be prevented by antioxidants, and especially Vitamin E. Most of the blogs I read said that castor oil is rich in Vitamin E, but I was not able to verify this definitively. If anyone knows the breakdown of all the vitamins and minerals in castor oil, please let me know! Castor oil is a humectant, so it attracts water vapor towards the skin and hair. Better moisturized hair looks fuller and glossier. This might lead some people to believe that their hair is growing or getting thicker. Androgenetic alopecia (AGA) or male pattern baldness is quite a complicated subject. One of the things that happens is that hair follicles become abnormally small, causing the new hairs that grow from them to be very thin and weak. The normal growing phase for hair can be 2 to 10 years, but it is reduced to a few months with AGA. Some scientists have linked an overproduction of a molecule called Prostaglandin D2 (PGD2) with hair loss. A study in China found that ricinoleic acid seemed to be an effective natural treatment for stopping overproduction of PGD2 and that it was safe to use and unlikely to cause adverse skin reactions. Castor oil is the source of ricinoleic acid, so it makes logical sense to assume that it will have the same effect. It is easily absorbed into the skin and acts as an emollient or softening agent. Castor oil can easily carry other nutrients or cosmetic ingredients into the skin. The ricinoleic acid acts as an astringent and so it constricts and tightens body tissues. This makes it a great choice for those with very oily skin. It is non-comedogenic and will not block the pores. This is mainly because of the low levels of fatty acids such as linoleic and oleic acids. It is the most common used base for make-up removers and cleansers for OCM (the oil cleansing method) and is said to restore your skin’s natural oil balance. The most common type of castor oil is the color of pale straw, or somewhat golden. It should be quite thick with a viscosity similar to honey. If it is dark or is cloudy, it is best to discard it. However, there is a "Jamaican Black Castor Oil" which is produced by roasting the castor beans for an extended period. You can read about using this Black Oil for your hair here. All extraction of castor oil uses some level of heat. The beans are cooked at the start of the process. High temperatures are used for industrial purposes because up to 80% of the oil can be extracted with heat, while only 45% is extracted with cold pressing. Using temperatures below 50 degrees helps retain the natural properties of the oil, including its vitamin and mineral content. Castor oil has quite a strong odor, which some people don’t like. If it has no odor, that means that it has gone through several refining steps, including bleaching and deodorization. This usually involves high heat and chemical solvents. Highly refined oils are fine for industrial use, but probably not for your skin and hair. "Pale pressed" or AA Standard from the first pressing of the seed. This is what many people refer to as "virgin". It is lighter in color and is less acidic than industrial grades. It may, however, be diluted and quite thin. It is also important to make sure that your oil is cold-pressed if you want top quality or food grade oil. Industrial or "#1 Imported" is when the first pressing is combined back with the next batch of seeds. This process is repeated several times. The seed bulk is finally compressed into "castor cake", crushed again and is often treated with solvents to get the last of the oil out. A label should give you all the above information. If it doesn’t you can usually assume the worst. 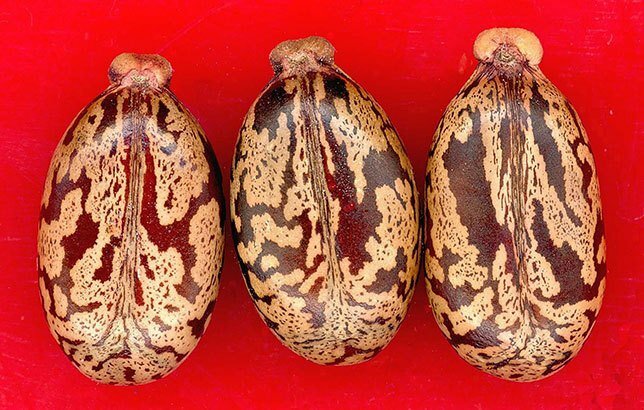 It should be noted that there are ongoing attempts to genetically modify castor oil plants to remove the dangerous ricin toxin. It is unclear whether this will have any impact on the other natural properties of the plant. I selected products that were advertised for both hair and skin use and that had large numbers of positive reviews. Then I evaluated their labels to see whether they gave sufficient information to potential shoppers. I converted all the prices to cost per 100ml so they could be fairly compared. After that, I looked at any additional benefits claimed for each brand. The results were quite surprising. Here are the products I looked at. I’ve presented them in the order that I ranked them. I liked everything about this product. Just looking at the label gave me confidence. The oil is bottled in the USA but sourced directly from organic, artisanal farmers in India. Its claims are backed up by certification, so you don’t have to wonder about how organic or pure or unrefined it is. Even the bottle is BPA free so that there is no leakage of toxins into the oil. They don’t claim that this is virgin oil, but it is likely to be virgin oil because it is produced by artisanal farmers. The label is clear and gives a surprising amount of information about source, properties, directions for use. I also liked the tips and advice they give on their website. Apparently, the product comes with an e-book of ideas on how to use the oil. Their recipe for a peppermint/jojoba/castor oil hair mask looks great, and they explain what each product does. This was one of the few sites I found that recommended that you rub a few drops of castor oil onto your lips to make them soft and plump. Why not, considering castor oil is used in most lipstick brands? They recommend adding castor oil to your hair conditioner. It should be about 20% of the mixture. This product met all the criteria of what to look for in the best castor oils and exceeded expectations whole list of extra features. Once I checked the price, which is just over $3 per 100ml, I was completely sold. This product is my top pick as the best castor oil to buy. I liked that this brand met most of the criteria for good quality. I didn’t have a bottle handy and couldn’t find reference to its appearance though so I wasn't able to rate that portion. This is a company that seems to be very environmentally conscious and concerned about additives in products. The label on the box gives a list of everything the oil is "free of": paraben, sulfate, phthalate, parfum, gluten, triclosan, petroleum, synthetic dyes. I’m not sure why this list was necessary if the oil is guaranteed 100% pure, but it may answer questions from some customers who are not sure about ingredients. The company advertising focus seems to be that castor oil provides real benefits to skin, hair, eyelashes, eyebrows and nails without the need for harsh chemicals. The oil has an ECO certification which is an indicator that sustainable production processes have been followed. They are targeting customers who want to use the product for their eyelashes, and they provide a mascara-type brush and an eyeliner-type brush for this purpose. I liked the company’s long response to a question about whether the product was food grade as it highlighted the updated FDA requirements for labeling. It also highlighted the difference between "cold-pressed", which is usually food grade and "pale-pressed" which may be "virgin" but is not food grade. They explained why this product would be safe to ingest, even though the labeling laws make them say that it is for external use only. This product was my second favorite. I would have scored it higher, but it is by far the most expensive brand at about $100 per 100ml, or about $47 if you find it on sale. Why is there such a long shelf life? This is a family owned business, based in Colorado. I really like it when a company offers a no-questions-asked guarantee on product quality and customer satisfaction. They promise a full refund even if you return an empty bottle. Maybe they’ve been in business long enough to know that the promises on their bottle are true: the oil will fade scars and stretch marks, thicken eyelashes and promote hair growth. They focus on the antibacterial and antimicrobial properties and high Vitamin E in the oil as the basis for the "beautifying effects" when used for skincare. A bonus is that the oil comes with a dropper, so there is no waste and no mess. The eyelash wands and eyebrow brushes mean that you know exactly how to apply the oil. What I didn’t like is that they promise a shelf life of 2 years. This suggests that the oil has been through significant refining processes. I was a bit alarmed by their suggestion that castor oil had benefits for oral care, proper lactation and birth control. What is the basis for these claims? The price is quite high, at about $50 per 100ml. Even the sale price was high, at about $20 per 100ml. I liked that the focus of this product is the emollient (moisturizing) properties of castor oil, and its skin softening properties. The directions on the label suggest massaging a few drops of oil into the skin where needed. Also, the label recommends adding a few drops to your normal shampoo to get softening benefits for your hair. The castor oil product is positioned in the company’s range of personal care products. All of them avoid harsh and synthetic chemicals, and use natural products. The label is clear that this is primarily a external use skin product. However, it is food grade. The company warns that you should consult a qualified healthcare professional before ingesting castor oil. I didn’t really dislike anything about this product or its marketing, but there seems to be missing information, and, at best, I felt neutral about it. That was until I saw the price. About $2 per 100ml is very reasonable! I upped my rating accordingly, and ranked it at 4th. The label on the bottle gives very little information other than that this is a 100% pure and natural oil, packed in the UK. I had to search for additional information on the company website. What I liked is that the company seems to be environmentally conscious. This oil is registered vegan, which means that the production is monitored to ensure that there is no contact with animal products, and that there is no testing on animals. The vegan sunflower logo is displayed with several the products on the site. They noted that the color and odor could differ from batch to batch as this was a natural product. Also, they didn’t make unsubstantiated claims. They used phrases like, "the oil is widely used to strengthen dry hair", "castor oil on eyelashes and eyebrows may promote hair growth" and "it can help with beard growth". "Our Castor Oil is typically rich in palmitic, stearic, oleic and linoleic acids." Really? This is exactly what castor oil is not rich in. It is up to 95% ricinoleic acid. This is what makes it unique. Other seed oils are rich in the other fatty acids. This product is listed in the skin care section, but gives the nutritional values of the oil on the label. (Maybe this is to indicate that it is food grade?) The website gives information about how vegetable oils are used in food preparation. I’m not sure who would be using castor oil on their salad! It’s a laxative. Fortunately, this section ended with a recommendation to seek medical advice before ingesting castor oil! I’m also not certain about how refined this oil is. It says that it is hexane free. However, an answer to a customer question indicated that this was a refined, rather than an unrefined oil. The price is in the lower range for the products reviewed, at about $16 per 100ml. This persuaded me to raise my rating a little. I ranked it at 5th mainly because there was so much missing information, not because the oil seemed to be of poor quality. In my review, I made every attempt find out whether there was sufficient information provided to allow for an honest assessment of the quality of the oils. I was surprised by how little was given on some labels, and how difficult it was to find some of the information, even when I went to the company websites. I was also surprised at the huge range of prices for these products – from about $2 per 100ml to about $100 per 100ml! I recommend that you try some castor oil for hair and skin. Although there are very few clinical studies, anecdotal evidence is strong that castor oil supports hair growth and hair thickness, and this includes eyelashes and eyebrows. It also has good moisturizing properties for skin and nails. I hope you found this article helpful. Please tell me your stories about how you decide what is the best castor oil.